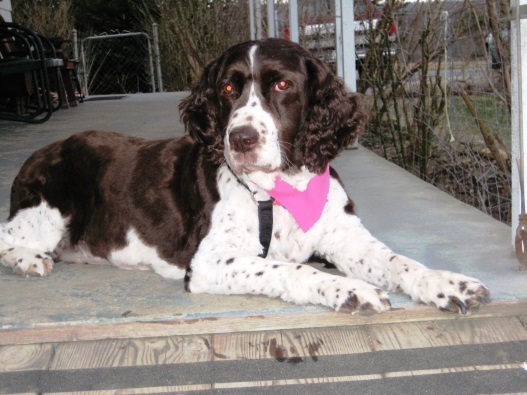 Mid Atlantic English Springer Spaniel Rescue - Where Do Your Donations Go? Home > Donations > Where Do Your Donations Go? Every donation helps to save a dog and on this page we will be featuring dogs that may not have made it without your help. Molly was an 8 year old ESS, abandoned by her owners to live on the streets when they found she had a 2nd round of mammary tumors. While it's not known how long this beauty was on her own, it was long enough that her tumor was larger than a baseball. She was turned into an Ohio shelter by the dog warden. That shelter and a second shelter felt she might have cancer (although not confirmed) and was a candidate to be euthanized. The volunteers at the second shelter loved her sweet spirit and got in touch with MAESSR to ask for help and the MAESSR President said yes, MAESSR would take her in. Springers are not turned away from MAESSR, even if some of the dogs do have serious issues. Molly had two surgeries for her mammary tumors - the first for her visible tumor, and the second for 32 smaller mammary tumors. The vet bills were expensive, but MAESSR did everything possible to help this girl’s health so she could find a forever home. All through her surgeries and rehab she was loved by everyone she met during her 3-month foster care. We were fortunate enough to be selected as Molly’s forever home. She was such a sweetheart, the typical Velcro springer, always carrying a soft toy, wanting to play tug of war, go for walks, cuddle and give lots of kisses. She quickly became the new best buddy to our 10 year old beagle, Daisy. Unfortunately, we only had Molly as part of our family for 379 days because she was diagnosed with lung cancer, which progressed and affected her motor skills quickly, forcing us to help her to the rainbow bridge only 25 days after her diagnosis. This is not meant to be a sad story, although we miss her greatly. This story is to let you know the extent to which MAESSR goes to help the dogs they rescue. Some of the rescues have serious untreatable health issues and become permanent fosters until they cross the rainbow bridge so that they will know love and companionship their final days. Some of the rescues have serious treatable health issues that require a lot of treatment and expense, but once the vetting is completed, they can go to a forever family. Some of the rescues have few issues, but no matter what, all of the rescues enter MAESSR care through no fault of their own and all are treated for any health issues, reside in foster homes and are loved while awaiting their forever family. Thanks to MAESSR’s intervention, Molly was actually given an extra 15 months of living and an extra 15 months of loving that she would not have had without MAESSR. Her wish is that all MAESSR foster dogs requiring extra health care would be taken care of financially so that more ESS’s and honorary ESS’s can be rescued. Won’t you consider donating so that other English Springer Spaniels like Molly can be given another chance at a forever home? Molly was such a joy and our MAESSR experience so positive that we are planning to adopt from them again. How about you? Won’t you consider adopting a MAESSR rescue? If you would like to donate to support the dogs in MAESSR's care, please click here.